We’ve all heard that synthetic oil is better than conventional oil. But what really makes it better? And what difference will it make to your riding experience? Read on to find out. Platinum Heavy Duty Full Synthetic Oil by Spectro Performance Oils is the lubricant of choice here at Rollies Speed Shop. While regular motor oils are refined, synthetic oils are additionally distilled, purified and then engineered on a molecular level to provide a far superior lubricant. 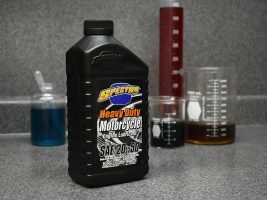 Spectro’s Platinum Heavy Duty Oil is specifically engineered to suit high performance V-Twin engines, making it perfect for any Harley-Davidson® rider. Riders who use Spectro Synthetic Oils notice a range of benefits including smoother running, reduced friction and increased horsepower. As Spectro’s Platinum Havey Duty Synthetic Oil contains fewer impurities than standard motor oil, your engine will stay cleaner for longer. The synthetic formula reduces wear on your engine’s moving parts, which can greatly reduce engine wear and break down and increase the life of the engine. A well engineered synthetic oil will also flow better at cold temperatures. In the winter months conventional oils can take time to warm up and flow smoothly through the engine. Platinum Heavy Duty Synthetic Oil is engineered to flow quickly even at low temperatures, providing your engine with superior protection as soon as it is started. Additionally, Spectro Platinum provides better protection at high temperatures. A running engine produces extreme heat, which can cause conventional motor oils to break down or evaporate, which in turn exposes your engine to wear. Spectro Platinum Synthetic Oil is formulated to resist high temperatures, making it ideal for high performance applications or riders living in hotter climates. If you haven’t already tried Spectro Synthetic Oil we recommend you give it a go at your next service. You’ll notice the difference. Need more convincing? Watch the enigmatic Bob LaRosa from fixmyhog.com deliver a sermon on Spectro Oils that will convert any non believer.